Ask Dad how he wants to spend his special day. Maybe he wants to sleep late, hang out with some buddies, go fishing, have total control of the remote control as he veggies out on the couch. Special days are made more special by letting the honoree dictate how it will be celebrated. 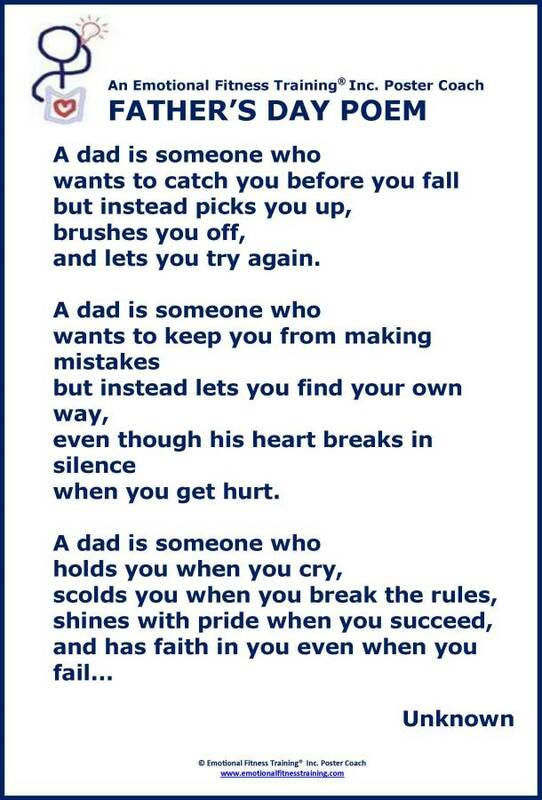 This entry was posted in Parenting Issues and tagged A poem about dads, Emotional fitness, Emotional Fitness Training, Emotional Health, Father's Day, Honor your father, Katherine Gordy Levine, Life, parenting, Parenting advice, Parents Are People Too, postaday, Take A Break, Thinking about what matters. Bookmark the permalink.